The Washington Redskins are prepared to pay the freight to the St. Louis Rams to move into the No. 2 pick in the 2012 NFL Draft, Mike Jones of the Washington Post reports. According to Jones, the Redskins are prepared to package two first round picks -- this year's No. 6 and their 2013 pick -- as well as other picks in the "upper to mid-round range". With Baylor quarterback Robert Griffin III solidifying his status as the No. 2 prospect in the draft, and the Rams already having a young franchise quarterback in Sam Bradford, St. Louis has made no secret about their desire to trade out of that slot. Jones notes that the Rams are believed to be seeking compensation similar to what the New York Giants traded to the San Diego Chargers in exchange for Eli Manning in 2004. That deal included the fourth overall pick (Phillip Rivers), a 2005 first round pick, and picks in the middle rounds (a three and a five). The Redskins are expected to face competition from quarterback-needy teams like the Cleveland Browns, who possess two picks in the first round this year, and Miami Dolphins for the No. 2 pick. Unless blown away by an offer, the Rams are expected to wait until just before the draft before making a trade. Griffin passed for 4,293 yards with 37 touchdowns and just six interceptions in 2011, adding 699 yards and 10 touchdowns on the ground. During his 41-game career at Baylor, Griffin passed for 10,366 yards with 78 touchdowns and ran for 2,254 yards with 33 touchdowns. If (when) the Indianapolis Colts release quarterback Peyton Manning, he and unrestricted free agent wide receiver Reggie Wayne could be a package deal, Peter King of Sports Illustrated suggests. Wayne, 33, has caught 862 passes for 11,708 yards and 73 touchdowns, mostly from Manning, Wayne's quarterback for 10 of the last 11 seasons. Wayne had seven straight 1,000-yard seasons from 2004-10 and went to five straight Pro Bowls from 2006-10 before playing without Manning in 2011. 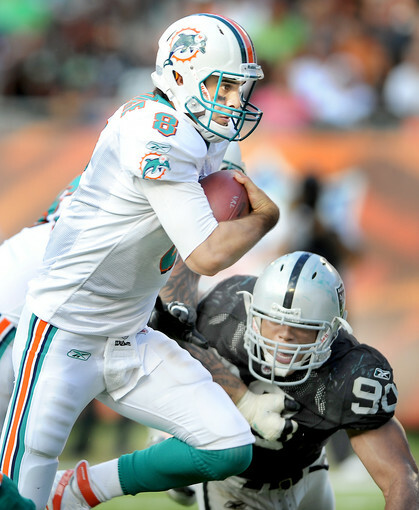 King adds that the Miami Dolphins could be a suitor for the duo. The Dolphins need a quarterback, owner Stephen Ross needs to reinvigorate the ticket-buying public, Manning and his wife have had a condo in Miami for years and Wayne played his college ball at Miami and lives in the Miami area in the off-season. The New York Jets, Seattle Seahawks, Washington Redskins, Arizona Cardinals and Kansas City Chiefs are also listed as potential suitors for the 18-to-87 Combo. If there were any doubt in the wake of Peter King’s latest Monday Morning Quarterback column (and there shouldn’t have been), there’s definitely none now. The Rams, according to Adam Schefter of ESPN, will trade the No. 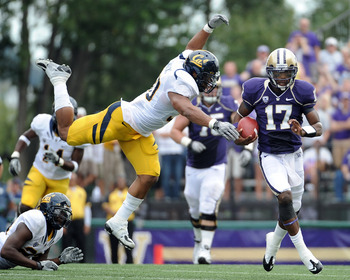 2 overall pick in the 2012 draft, which barring something completely unforeseen and unexpected will be used on Baylor quarterback Robert Griffin III. The only remaining question is the “who” and the “how much.” The fact that the draft picks are now subject to a genuine rookie wage scale, which drives down the financial cost of using the second overall pick, and could drive the picks-and-players cost even higher. The prime candidates to trade up remain the Browns (No. 4 and 22 overall), the Redskins (No. 6), the Dolphins (No. 8), and the Seahawks (No. 12). As King pointed out both in MMQB and on PFT Live, there could be one or more mystery teams. And that’s where things could get very interesting. If, as suggested earlier in the day, Griffin’s finds extra motivation in the fact that the Colts aren’t given the likely second pick a second glance, Griffin could be the perfect target for the team that holds the No. 7 selection: the AFC South’s Jaguars. Yeah, they’re committed to Blaine Gabbert, who arrived via the 10th overall pick in 2011 after the Jaguars gave up a second-round pick in order to flip-flop first-round spots with the Redskins. But what better way to throw other teams off the scent than to create the impression that Gabbert remains the guy? New Jaguars coach Mike Mularkey and new Rams G.M. Les Snead worked together in Atlanta, which could help Mularkey achieve and maintain extreme discretion from Snead while the talks secretly occur. And new Jags owner Shahid Khan may be willing to mortgage a chunk of his future drafts in order to secure the franchise’s future as a contender for the next 10 years or more. Throw in the fact that Griffin would get two cracks at the Colts every year, and the move seems far less ludicrous. Few players have helped themselves more at the Scouting Combine than Cal linebacker Mychal Kendricks, who had an outstanding day on Monday afternoon. 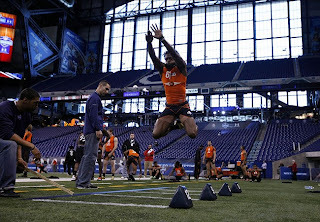 Kendricks was the fastest linebacker at the Combine, finishing the 40-yard dash in 4.47 seconds. That even beat the official time put up by North Carolina’s Zach Brown, a college track star who had an impressive showing and was officially timed at 4.50 seconds. 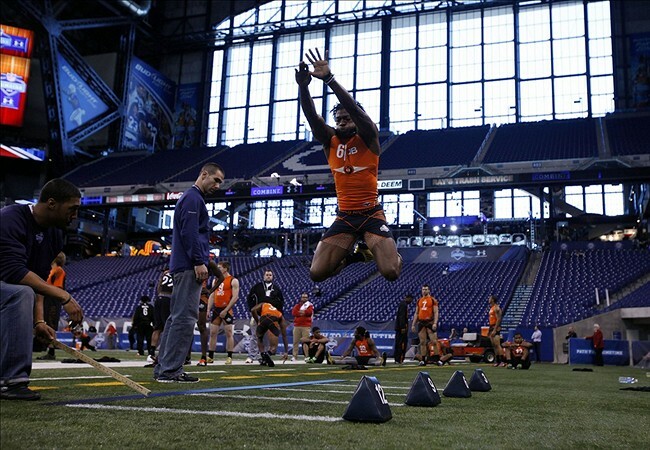 Kendricks also had the best vertical jump among all linebackers at the Combine, at 39.5 inches, and the best broad jump, at 10 feet, 7 inches. And he looked very impressive in the linebacker on-field drills. The Pac-12 Defensive Player of the Year Award winner last year, Kendricks said he models himself after 49ers linebacker Patrick Willis. He certainly took care of business today. The Miami Dolphins are in the market for not one, but two quarterbacks this off-season, Omar Kelly of the Sun-Sentinel reports. 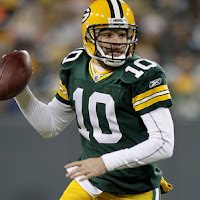 Miami has been linked to Green Bay Packers quarterback Matt Flynn, who played for Dolphins head coach Joe Philbin and could hit the free agent market on March 13. Indianapolis Colts quarterback Peyton Manning has also been linked to the Dolphins, who are also expected to add a young quarterback in the draft, Kelly reports. Miami has two quarterbacks signed for 2012 -- Matt Moore and Pat Devlin -- neither of whom are expected to be the team's long-term answer at the position. Signed to a two-year deal after spending the previous four seasons with the Carolina Panthers, Moore replaced an injured Chad Henne to start the final 12 games of the season. Overall, the 27-year-old from Oregon State completed 60.5 percent of 347 pass attempts for 2,497 yards with 16 touchdowns and nine interceptions. Moore is scheduled to earn $2.75 million in base salary. If Flynn and Manning remain with their current teams orsign elsewhere, Moore could potentially compete with an early round rookie for the starting job in 2012. Devlin joined the Dolphins as an undrafted free agent out of Delaware. In two appearances in the preseason, Devlin completed three of five pass attempts for 30 yards, losing two yards on a pair of sacks in his preseason debut. The Dolphins signed Devlin to their practice squad in Week 1 and added him to their active roster for the final two weeks of the season. Should the Dolphins add a Flynn or Manning, Devlin would likely compete with a late-round rookie for the No. 3 quarterback spot on the roster. We have yet another reason to believe that the Colts will cut Peyton Manning before his $28 million roster bonus is due on March 8. 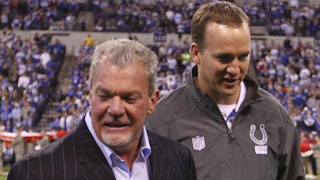 Albert Breer of NFL.com notes that the Colts owner Jim Irsay, G.M. Ryan Grigson, and coach Chuck Pagano can’t watch Manning throw until April due to rules in the new Collective Bargaining Agreement. The Colts’ medical staff can watch Manning and report back, but they are not allowed to tape the workout. 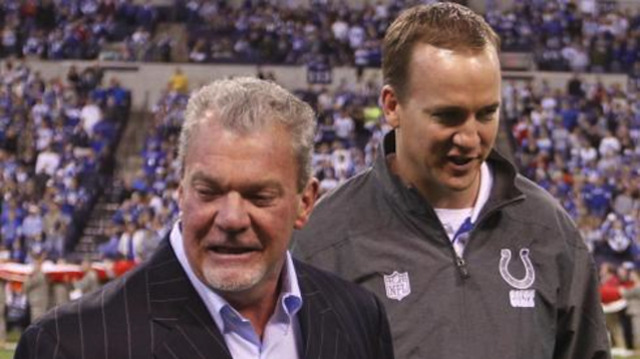 Longtime Manning teammate Jeff Saturday insists that Manning will play in 2012. It’s hard to imagine Manning playing for the Colts if the team can’t see his on-field progress before investing that kind of money in him. 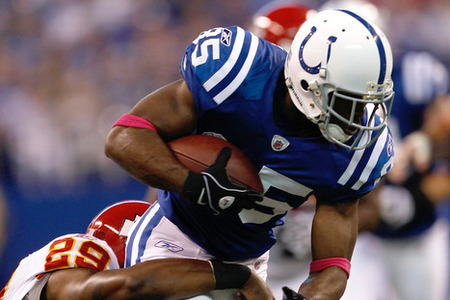 According to ESPN's Adam Schefter, wide receiver Pierre Garcon recently rejected a five-year contract extension offer from the Indianapolis Colts. Pertinent financial details such as average per year and guaranteed money within the rejected Colts offer were not disclosed. Garcon will be an unrestricted free agent on March 13, though the Colts have the option of using the franchise tag on Garcon, which is projected to be worth around $9.44 million in 2012. The 2008 sixth-round pick out of Mount Union caught a career-high 70 passes for 947 yards and equaled his career-high with six touchdown receptions. The 6-foot, 210-pound Garcon moved into the starting lineup in 2009 and has 188 receptions for 2,519 yards and 16 touchdowns in 58 career games. 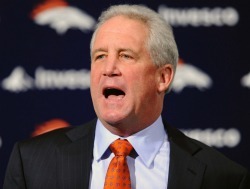 Broncos coach John Fox was lauded for changing his offense during the 2011 to take advantage of Tim Tebow’s strengths. With an offseason to prepare Tebow as a starter, it sure sounds like Fox wants to make Tebow look more like the rest of quarterbacks in the NFL. “[Tebow] is going to be a great quarterback in this league. How long it takes (and) when? I can’t tell you. 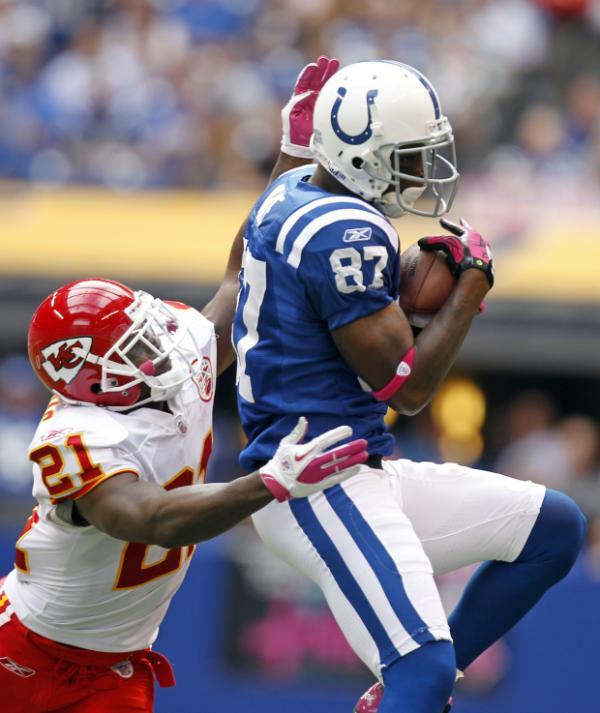 But he’s going to be that guy in a regular NFL offense,” Fox said. The Broncos certainly didn’t run a “regular” offense last year. Fox indicated that he wouldn’t necessarily go looking for a Tebow-style backup, but would be open to any style of quarterback on the roster behind Tebow. Essentially, they want Tebow to fit more into the mold of a traditional quarterback. There has been a lot of chatter at the Combine about the Browns trying to trade up for Robert Griffin III. But what if Cleveland has already invested big bucks in a quarterback well before the draft? Steve Doerschuk of the Canton Repository writes the Browns brass “will make a play for Matt Flynn” with the hopes of making Flynn the team’s starter. They will have competition, though. “There will be a budget that will not be exceeded in the play for Flynn,” Doerschuk writes. Teams like Cleveland and Washington are in a tough spot. 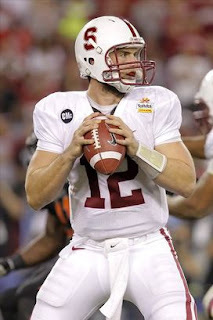 They may want Griffin, but can they wait for him and risk getting stuck in another season without a real quarterback? Earlier today, we pointed out that, once Friday’s coin flips lock in the 2012 draft order, the Colts may sign Andrew Luck, or any other player whom they’d like to make the first overall pick in the draft. Unlike past years, the presence of a true rookie wage scale with little room to maneuver and few topics about which to negotiate, it’s far more likely that a contract will be signed before the draft begins. And given the ease with which first-round picks can now be negotiated, some of you have expressed concern regarding the ability of the Rams at No. 2 and then the Vikings at No. 3 and then the Browns at No. 4, and so on, to sign their first-round picks and make the first night of the draft less meaningful. Fear not. NFL spokesman Greg Aiello tells PFT that only the team holding the first overall pick may strike a deal in advance of the draft. So if (when) the Colts ink Luck, the Rams (or the team to which the Rams trade the second pick for the ability to take Robert Griffin III) will have to sit tight until the first night of the draft. Pittbsurgh Steelers quarterback Ben Roethlisberger and offensive coordinator Todd Haley have met recently, Ed Bouchette of the Pittsburgh Post-Gazette reports. CBA rules prevent discussion between players and coaches regarding playbooks and strategy until mid-April, but Roethlisberger was close with former offensive coordinator Bruce Arians, who was fired after the season. 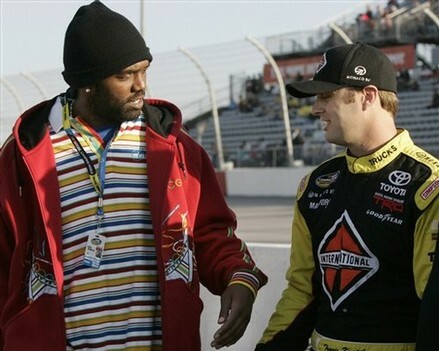 Much had been made about Roethlisberger and Haley not huddling after the latter's recent hiring. "I've heard a lot of things (about Haley) and I'm looking forward to meeting him and forming my own opinion," Roethlisberger said last week. Now that they've met, let the opinion-forming begin, though I suspect that won't actually happen until the offense is installed and the duo has a few games under their belt. Another year, another second-round pick devoted by the post-Marino Dolphins on a quarterback gone. The last remaining second-round quarterback on the roster, Chad Henne, becomes a free agent on March 13. Omar Kelly of the South Florida Sun-Sentinel (via NFL.com) reports that the team won’t make Henne an offer. With a new quarterback and a new offensive coordinator, it’s not a surprise. And so Henne will join A.J. Feeley (2004, via trade), Daunte Culpepper (2006, via trade), John Beck (2007), and Pat White (2009) as failed Dolphins quarterback who arrived via the investment of a second-round pick. It’s unclear what the team will do in 2012. But here’s hoping that they don’t pick a quarterback in round two. For Henne, the head coach who drafted him in 2008 (Tony Sparano) is now the offensive coordinator of the Jets. So don’t rule out Henne becoming the new backup to Mark Sanchez. Running back Brandon Jacobs tells Jim Miller and Rich Gannon on SiriusXM NFL Radio that he "fully expects" to be back with the New York Giants in 2012. “Well, I have spoken to my agent and I do expect to be fully back with the New York Giants next season," Jacobs said according to Mike Garafolo of The Star-Ledger. "These guys in the front office, they’ve been doing this for years. They know what they gotta do. I want to be back. But they actually know what has to be done if they want me back." Though he's behind Ahmad Bradshaw on the depth chart, Jacobs had nearly the same number of carries (171-to-152), rushing yards (659-to-571), yards per carry (3.9 to 3.8) and his seven touchdowns were two less than Bradshaw's nine during the 2011 season, though Bradshaw did miss four games with a foot injury. 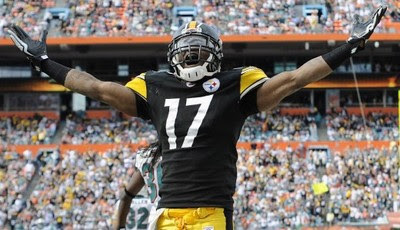 Jacobs turns 30 in July and is scheduled to earn $5 million in 2012, including a $4.4 million base salary and a $500,000 roster bonus that comes due on the fifth day of the 2012 league year (March 17). The Giants are currently over the salary cap and releasing Jacobs would clear $5 million of space . "If they don’t want me back then that’s another story in itself, then nothing has to be done. But I got a feeling that they do," Jacobs added. So, you know, things get worked out. 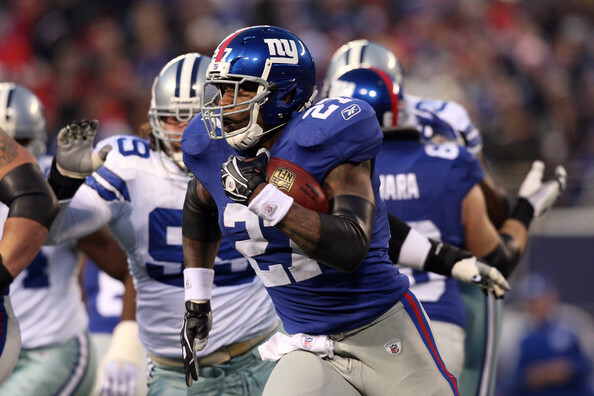 I definitely plan on being Big Blue for the 2012 season." The decision makers in Denver have declared repeatedly that Tim Tebow will enter training camp as the Broncos’ No. 1 quarterback, but they want to have someone who can compete with him. Now Broncos coach John Fox has said he doesn’t just want one quarterback to compete with Tebow, but two. Fox told Mike Klis of the Denver Post that he expects two new quarterbacks on the roster this year. Those comments are consistent with what both Fox and front office boss John Elway have indicated all along: Tebow did enough last season to earn the No. 1 job, but not enough for the Broncos to declare that the franchise is all-in on Tebow. He has to keep earning the No. 1 job with an impressive offseason, because Fox would be open to the idea of someone else beating Tebow out for the No. 1 job in training camp. The question is who those two new quarterbacks competing with Tebow will be. Maybe one will come from the draft and one from free agency, but if you’re a free agent quarterback who’s hoping to compete for a starting job somewhere, do you really want to do it in Denver, where you know the fans will stridently oppose you in your quest to wrest the starting job away from the beloved Tebow? And given that the Broncos will go into the offseason planning an offense that will revolve around Tebow’s unique skill set, it’s going to be tough to convince other quarterbacks that Denver is the right place for them. Regardless of who’s involved in the quarterback competition, Fox says he’s confident he’ll see a better Tebow in 2012 than he saw in 2011. And if he doesn’t get better, he’ll have two other quarterbacks trying to take his job. New York Giants defensive end Osi Umenyiora is unsure if Super Bowl XLVI was his final game with the team. "We’re just going to have to wait and see," Umenyiora said on ESPN's "Mike & Mike" radio program on Monday, via a transcription provided by Michael David Smith of ProFootballTalk.com. "I can see it going either way. I can see where they would keep me, I can see where they would trade me, because it makes sense both ways. "So hopefully things will work out in my interest. I know the team is going to do what’s best for them. They’ve always made the right decisions for that organization. Whether that’s keeping me or trading me, I’d love to stay, but at the end of the day I understand it’s a business and hopefully things will work out." Umenyiora has not been happy with his contract and briefly held out of training camp last year. The 30-year-old defensive end missed seven games in 2011, but still produced nine quarterback sack and added 3.5 more sacks in four playoff games. The veteran is due $3.975 million in base salary and $750,000 in roster and reporting bonuses, all of which could be cleared from the Giants' salary cap if he were released or traded this off-season. Ravens running back Ray Rice is set to become an unrestricted free agent next month, and given that there’s been no progress on talks for a long-term deal, Baltimore will surely use the franchise tag to keep Rice in place. That may lead to months of negotiations between Rice and the Ravens, and Peter King writes at SI.com this morning that Rice wants an Adrian Peterson-like contract. Peterson signed a seven-year, $100 million contract in September, with $36 million guaranteed and $40 million in the first three years. 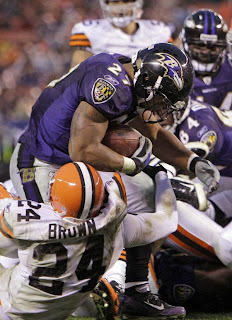 However, it’s also easy to see why the Ravens would be extremely reluctant to give Rice that kind of money. Running backs have proven to be fungible, prone to injury and susceptible to sudden declines in the quality of their play, and NFL teams that give lucrative long-term deals to running backs often live to regret it. Would the Titans still give Chris Johnson a huge contract knowing that he would have career lows in yards, yards per carry and touchdowns last year? Would the Panthers still give DeAngelo Williams a huge contract knowing that he would average 52 yards a game last year? Would the Vikings still give Peterson that contract knowing he was going to tear his ACL less than four months later? So while the Ravens are reportedly ready to start talking to Rice’s agent at the Scouting Combine, starting to talk and working out a deal are very different things. What the Ravens would rather do is have Rice play for the one-year franchise tender of $7.7 million. The wild card in all this is that there might be a team out there willing to sign Rice to a long-term deal and give up the two first-round draft picks they would have to surrender to the Ravens if Baltimore doesn’t match the offer. Rice just turned 25 and hasn’t had any significant injuries, and if some team out there is in awe of the idea of getting five seasons of Rice’s services before his 30th birthday, maybe someone other than the Ravens will offer him Adrian Peterson money. The Cleveland Browns hold the fourth overall pick in the draft. Mary Kay Cabot of the Cleveland Plain Dealer reports that the Browns are considering five possibilities. Which means, if our math is correct (and it rarely is), that one of the five will be available when the Browns pick. 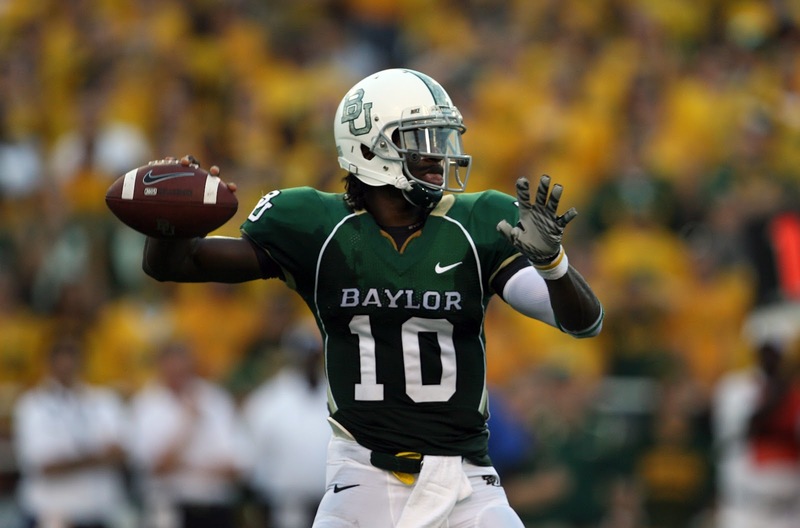 The quintet consists, per Cabot, of Baylor quarterback Robert Griffin III (pictured), Oklahoma State receiver Justin Blackmon, Alabama running back Trent Richardson, LSU cornerback Morris Claiborne, and Texas A&M quarterback Ryan Tannehill. The Browns could trade up for Griffin. Or they could trade down for more picks, like they did last year with the sixth overall selection. And three years ago with the fifth overall selection. Regardless, it’ll be the fourth straight year that the Browns have a top-10 pick. Which rarely is a good thing. The Peyton Manning story will be a daily soap opera for most of the offseason. Matt Flynn is this year’s Kevin Kolb. Drew Brees and Alex Smith aren’t going anywhere. After those four men, there hasn’t been a lot of talk about free agent quarterbacks. We’d argue that two players — Kyle Orton and Jason Campbell — would be better options than Flynn all money considered. Are Orton and Campbell ever going to be top-10 quarterbacks? Probably not, but the same holds true for Flynn. Orton and Campbell can perform at a competent level for a cheap price and win games if they have the right team around them. Teams like Washington, Miami, Cleveland, and even Jacksonville have to think about adding a veteran like them to the mix. Only one team gets Manning. After Orton and Campbell, there are some wild cards. 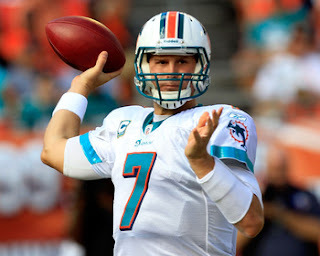 Chad Henne, Vince Young, Josh Johnson, and David Garrard should all get work. 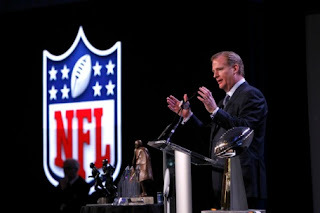 Though recent comments from Commissioner Roger Goodell to ESPN 1000 in New York regarding the league’s lack of an intention to expand its number of teams have gotten the most attention, it’s important to point out what Goodell said — and didn’t say — about the still-looming possibility of expanding the regular season. Actually, the more accurate statement seems to be that the fans want less preseason and the same regular season. Only season-ticket holders endorse the prospect of fewer fake games and more real ones, for obvious reasons. Well, obviously, it won’t happen in 2012. If the season were going to expand, plans already would have to be made for finding a way to wedge two regular-season games into a schedule that has 17 weekends of the regular season (with one bye per team) and one dormant weekend between the conference title games and the Super Bowl. (Unless, of course, the league would be interested in starting the regular season before the weekend after Labor Day.) 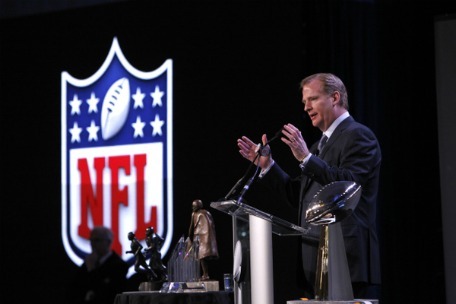 And if it’s going to happen in 2013, the NFL will have to work around the February 2, 2014 date for Super Bowl XLVIII in New York/New Jersey. Regardless, the 18-game concept remains on the table. And even though the league no longer has the unilateral right to expand the regular season, the current CBA gives the league the unilateral right to cut the preseason in half. As we’ve previously explained, that’s how the players would eventually be squeezed into agreeing to expand the regular season. The league would tell the players that two preseason games are going to be dumped due to the poor quality of play and the unacceptable risk of injury in games that don’t count. Given the current revenue-sharing model, the players then would realize that they’d be losing a ton of money if the preseason gets chopped in half — and they’d also know (thanks to the league’s detailed studies on the matter) the extra revenue that would be generated by the addition of two regular-season games. And so the players eventually would choose to add two regular-season games to replace the two preseason games. Whether it happens in 2013, 2014, 2015, or beyond, the league most likely will exercise the right to dump two weeks of the preseason, and then the players will have a big decision to make. The Cincinnati Bengals announced that Hue Jackson has been added to the team's coaching staff. Jackson, who coached the Bengals wide receivers from 2004-06, will help coach the team's defensive backs and special teams. 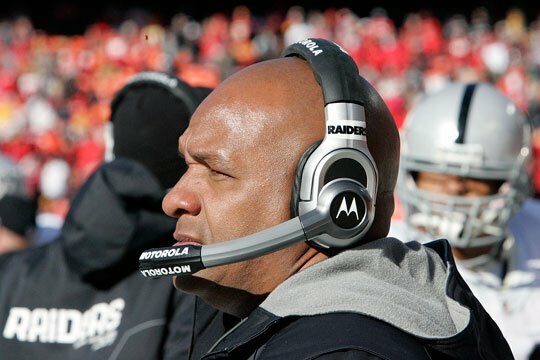 The 46-year-old Jackson was fired in January after just one 8-8 season as the Oakland Raiders head coach after serving as their offensive coordinator in 2010. Prior to his stint with the Raiders, Jackson coached quarterbacks with the Baltimore Ravens (2008-09) and was an offensive coordinator with the Atlanta Falcons (2007). Jackson has also coached running backs at the NFL level (2001-02 Washington Redskins) and coached special teams at the college level (Pacific, Cal State-Fullerton) and with the London Monarchs in the World League. 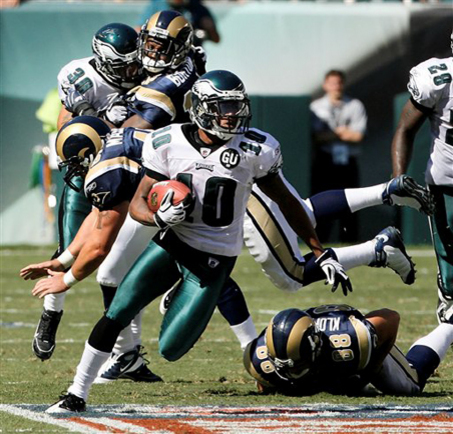 Another colorful NFL player that dominated headlines last decade wants to return to the league. 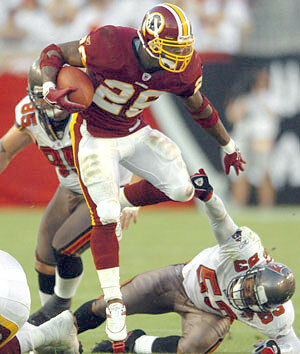 NFL.com’s Steve Wyche reports that Clinton Portis wants to play football again. His agent has already heard from a few interested teams and plans to meet with them at the Combine. Don’t call it a comeback just yet. It’s not like Portis chose to retire last year. He worked out for six teams and no one signed him to a contract. After one workout, he was reportedly said to be in poor shape. Portis told Wyche that he struggled with the idea of playing last year because he was “heartbroken” after getting released by the Redskins. But that doesn’t match up with his actions last year. Last August, Portis spread the word he was willing to pay his own way just to get to workouts. “I’m ready to go back, ready to work things out and I’m open to idea of going out to prove that I can still play,” Portis said Thursday. Perhaps Portis will get a test drive in training camp somewhere, but it didn’t happen for him last year. It sounds like he’s taking the Randy Moss approach and using a quiet time in the NFL news cycle to get some attention. If the Houston Texans have plans to franchise restricted free agent running back Arian Foster, then it won't be the worst thing in the world, says Foster's agent Mike McCartney. "The Texans have to do what's right for them, and we'll adjust accordingly. It won't affect us in any way," McCartney told 790-AM in Houston. Most players disdain the thought of the franchise tag being placed on them, but for Foster, who is an undrafted free agent made good, even the top restricted tender of a first-round pick as compensation might not be enough to ward off running back needy teams from coming after him with an offer sheet. If Foster is given the franchise tag and plays under it without an extension, he would earn $7.7 million in 2012. Plus, that gives McCartney and Foster a nice number to start at in negotiating a market value long-term deal with the Texans. NFL Network analyst Mike Mayock is a big Andrew Luck fan. Luck is the top player on Mayock’s board, and Luck’s passion for the game reminds Mayock of Peyton Manning and Matt Ryan. Mayock just doesn’t see Luck as some sort of “once in a lifetime” prospect like others have indicated. (Yes, others means ESPN in this case.) Mayock compared Luck’s talent level more to someone like Sam Bradford. That’s not an insult. Bradford was the top pick in the draft and Mayock is a big supporter of him. In terms of pure talent, Mayock said Luck isn’t quite at Peyton Manning’s level. He wouldn’t necessarily expect Luck to suddenly become Manning or Tom Brady. Mayock also said on a conference call Wednesday that he loves “everything” about Robert Griffin III, calling the Heisman Trophy winner one of the most exciting players in the last few drafts. He thought the Browns would be well served to look at trading up for Griffin. Add up the two comments, and this draft has two terrific quarterback prospects. There just isn’t as big of a gap between the two quarterbacks as we once imagined. 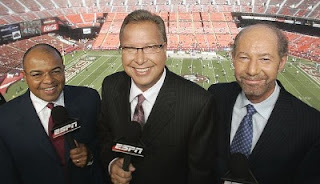 ESPN has announced that Ron Jaworski has signed a new five-year extension with ESPN that will increase his role as an in-studio analyst and remove him from the Monday Night Football booth. According to the release, Jaworski will appear on Sunday NFL Countdown, Monday Night Countdown, NFL Matchup, as well as SportsCenter, NFL Live, NFL Kickoff and the network's coverage of the NFL Draft and Super Bowl week. Jaworski will make appearances on Mike & Mike in the Morning, Pardon the Interruption, and other platforms and shows throughout the year. Jaworski will not be replaced in the Monday Night Football booth, with Mike Tirico and Jon Gruden forming a two-man broadcast. “I am grateful for having the once-in-a-lifetime opportunity of working on Monday Night Football the past five seasons with Mike Tirico, Jon Gruden and so many other talented people behind the scenes who make the show so great, and I look forward to bringing my passion and knowledge of the game to more fans in more places than ever before on any and all football topics,” said Jaworski. Randy Moss is planning a comeback, and his agent says three teams have already shown interest. But the Cowboys are reportedly not one of those teams. The Cowboys have already decided that they won’t be in the running for Moss, a source told ESPN’s Calvin Watkins. Cowboys owner Jerry Jones has said many times that he regrets passing on Moss in the 1998 NFL draft. Moss came out of Marshall as a big-play talent with off-field issues, and at the time Jones, who was concerned about cleaning up the Cowboys, was worried that Moss would tarnish the team’s image. Dallas drafted Greg Ellis with the eighth overall pick, and the Vikings ended up getting Moss with the 21st overall pick. But just because Jones wishes he had drafted the 21-year-old Randy Moss, that doesn’t mean Jones wants to sign the 35-year-old Randy Moss. Jones is apparently satisfied with the receivers the Cowboys have. The new collective bargaining agreement eliminated the "First- and Third-Round" restricted free agent tender, which could result in more offer sheets for Pro Bowl-caliber restricted free agents during the term of the new labor agreement. 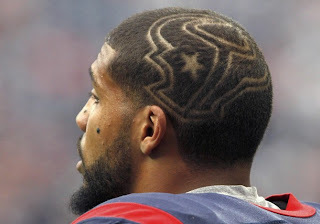 Two such players -- Houston Texans running back Arian Foster and Pittsburgh Steelers wide receiver Mike Wallace -- are restricted free agents this off-season and could receive the franchise tag as their clubs attempt to put up walls around the player to restrict their movement. Steelers general manager Kevin Colbert hinted that the team would consider using the tender on Wallace. "Certainly Mike has done a lot to establish himself as a Pro Bowl receiver, and we want to try to keep Mike here for the long run," Colbert said. A "First Round" tender is worth $2.742 million in non-guaranteed base salary in 2012, whereas as the franchise tag for wide receivers is projected to be worth around $9.5 million. For Foster, his tender (available on the same link) is projected to be worth around $8 million. Freddie Solomon, a wide receiver for the Dolphins and 49ers who was a key player on two Super Bowl-winning teams, has died at the age of 59. Solomon was diagnosed with colon and liver cancer nine months ago, and his health took a turn for the worse last week, the Tampa Tribune reports. As a quarterback at the University of Tampa in the early 1970s Solomon did sensational things with the ball in his hands, rushing for 3,299 yards, which at the time was the all-time NCAA record for a quarterback. Although the NFL didn’t have any place for his style of quarterback in those days, Don Shula was enamored enough with Solomon’s talent that he used a second-round draft pick on him in 1975. 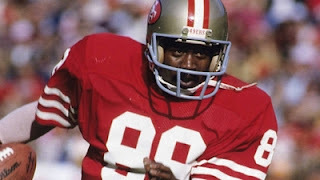 After three seasons in Miami, Solomon was traded to San Francisco, where he became a great fit in Bill Walsh’s offense. His best season was 1981, when he caught 59 passes for 969 yards and eight touchdowns. Following that season the 49ers won the Super Bowl, getting there when Joe Montana hit Dwight Clark in the end zone for “The Catch” to win the NFC Championship Game. Solomon was the first option on that play. Solomon retired after the 1985 season, and he came to be known in Tampa as much for his good works in the community as he was for his football heroics. He did outreach to young people through his work in community relations with the Hillsborough County Sheriff’s Office, and he teamed up with Eddie DeBartolo Jr., who owned the 49ers when Solomon played there, to provide an annual Christmas celebration for foster children. Solomon is survived by his wife of 33 years, Dee Solomon. DeSean Jackson isn’t going anywhere, at least not until the Eagles can get something for him in return. Jeff McLane of the Philadelphia Inquirer reports the team will place the franchise tag on Jackson. They may still look to see what Jackson could attract in a trade. The news doesn’t come as a surprise. It would only be a surprise if the team and Jackson work out a long-term deal at any point this year. It is far more likely Jackson plays under his one-year contract in Philadelphia or gets dealt to another team. Jackson said shortly after the season he would be fine playing with the tag. If that’s the case, he would be wise to sign it quickly so the Eagles can’t rescind the tag if they fail find a trade partner. Philadelphia has twice rescinded the franchise tag in similar situations. They did it with defensive tackle Corey Simon in 2005 and Jeremiah Trotter in 2002. The Eagles have room to carry Jackson’s salary, which is expected to be less than $10 million. Despite all the difficulties he had last season, ultimately Jackson is too valuable to simply let him walk away. Especially when 2012 is the ultimate “win or else” season for coach Andy Reid. 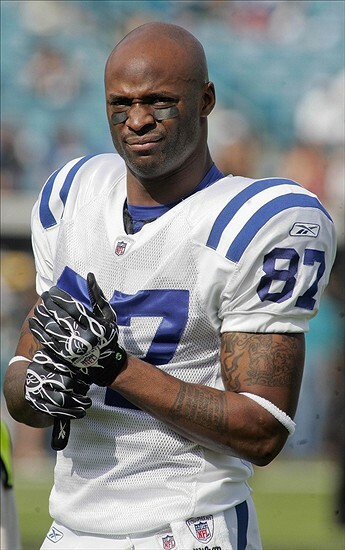 After 11 seasons with the Colts, Reggie Wayne is set to become an unrestricted free agent next month. And he says that if the Colts want to keep him, he hasn’t heard anything about it. With the Colts in rebuilding mode, it’s easy to see why they’d want to move on from the 33-year-old Wayne, who was still their No. 1 receiver last season but suffered from the absence of Peyton Manning and had his lowest output in catches, yards and touchdowns since 2003. Patriots coach Bill Belichick has been a longtime admirer of Wayne’s, saying during the 2009 season that he thought Wayne was the best receiver he had coached against. Sounds like a player Belichick would like to coach. 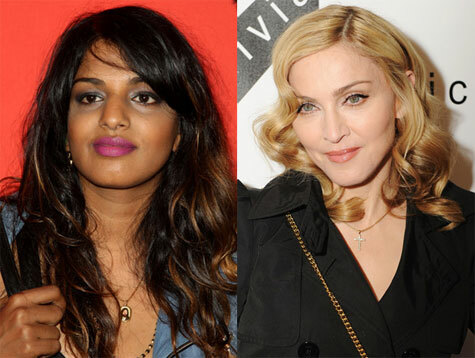 Madonna had kept quiet for five days after being upstaged by a middle finger shot to the crowd and cameras by M.I.A. during her five seconds or so of close-up time during the 13-minute lip-synch halftime show during Super Bowl XLVI. On Friday, Madonna spoke publicly for the first time about the incident. The irony is that, when Madonna was much older than a teenager, she was engaging in “teenager . . . irrelevant things to do,” all in the name of getting attention and/or notoriety and/or ultimately making more money. But she failed to realize someone would do to her exactly what she would have done to Cher or Diana Ross or Michael Jackson whoever else would have been reckless enough to invite Madonna onto the stage 25 years or so ago and to give her only a few seconds of time in the spotlight. As the Steelers scramble to clear cap space, a $4 million chunk could be opening up in one fell swoop. Jason La Canfora of NFL Network reports that the Steelers won’t bring back veteran receiver Hines Ward for a 15th season with the team. In 2011, Ward slid down the depth chart, which makes him way too expensive for his current contribution level. Also, even if he cuts his pay down to the veteran minimum, he’s in danger of occupying a position that ordinarily would require the wideout to play special teams. Maybe Ward will end up with the Colts, too. The Tennessee Titans are back at work re-signing players who were slated to become free agents. Today’s news is that wide receiver Lavelle Hawkins has signed a multi-year deal with Tennessee. 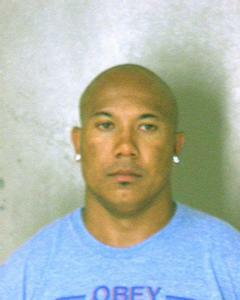 The contract was announced by the Titans, but terms were not disclosed. Hawkins, the Titans’ fourth-round pick in 2008, had 47 catches for 470 yards and one touchdown in 2011. The Titans have previously announced deals with tight end Craig Stevens and offensive tackle Mike Otto, both of whom were also going to become free agents on March 13. 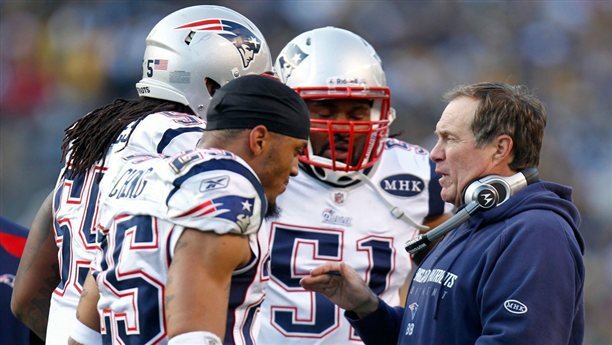 As expected, Patriots coach Bill Belichick planned to defend the Giants in Super Bowl XLVI by taking away what the Giants do best. And that meant shutting down receivers Victor Cruz and Hakeem Nicks. The Giants indeed went to Manningham, and Manningham made an uncanny catch of a perfect 38-yard throw from quarterback Eli Manning to spark the effort that allowed the Giants to win the game. Though Manningham didn’t have huge numbers, reliance on him in one of the game’s biggest moments meshed with something former Colts coach Tony Dungy had been saying last week. In the 2006 AFC title game, during which the Pats raced to a 21-3 lead, Belichick found a way to take away both Marvin Harrison and Reggie Wayne. The Colts then adjusted, targeting tight end Dallas Clark and taking advantage of opportunities in the running game. And so with Belichick so determined to take away what the opposing offense does best and with opposing offenses now figuring it out, the chess match needs to move to the next level, with Belichick making the enemy think he’ll be taking away the top weapons and then pouncing on the guy to whom the ball will actually go. The Chargers would have to pay Vincent Jackson a lot of money to use the franchise tag on him — more than $13 million. 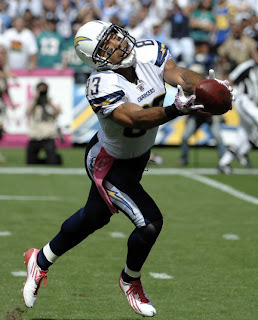 That’s why he’s expected to hit the open market, and he’s not expected to stay in San Diego. Kevin Acee of the U-T San Diego reported last month the Chargers would be “comfortable” giving Jackson a long-term deal, but they are unlikely to use the tag on him. We don’t think you can rule out a return to the Chargers, but Jackson has waited a long time and fought a few battles to get to this point. He only has to wait another month, so he may as well see what free agency is all about. It’s fitting, we suppose, that the only response to the post-game comments from Tom Brady’s wife ripping his teammates for dropping passes would come not from said teammates but from a guy who benefited from the blunders. “She just needs to continue to stay cute and shut up,” Giants running back Brandon Jacobs told reporters Tuesday regarding Gisele Bundchen, via ESPNNewYork.com. A potential problem arises if it wasn’t simply a short-term venting but a sign of deeper frustration. A frustration to which Brady will be subjected during the offseason, putting him in a very awkward and delicate position. Not all that long ago, when Brady was negotiating a new contract with the Patriots, we heard rumblings that she was pushing him to quit football. 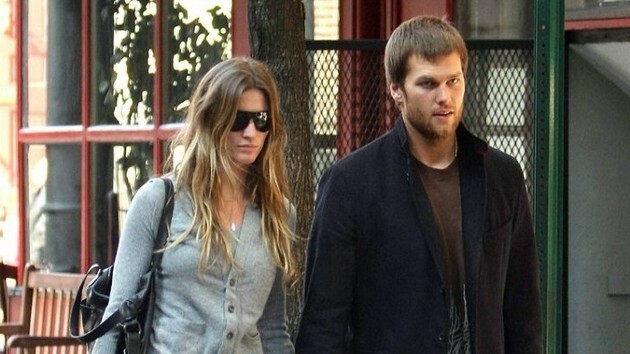 Money hardly is an issue for the Brady household; she makes significantly more than he does. Though Brady said last year that he intends to play 10 more seasons, Mrs. Brady may have other ideas, and her comments from Sunday could (key word: could) be the first step in the unfolding of a plan that results in Brady walking away well before his 40th birthday. 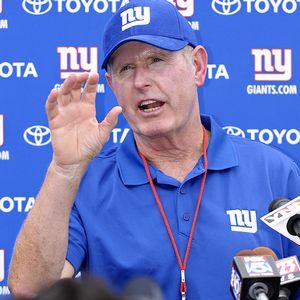 At age 65, New York Giants head coach Tom Coughlin became the oldest head coach to win a Super Bowl. With two Lombardi Trophies on his resume, Coughlin is a potential Hall of Famer, but has no plans to hang up his whistle. "I certainly hope so," Coughlin said on Monday when asked if he is coming back next season. "My intentions are to be that way. I do have some ownership that has to give approval, but I’m looking forward to it." Coughlin has been left for dead several times by the media, including once or twice in this space. With two Super Bowl wins in the last five seasons, there's no question that Giants ownership will let Coughlin continue to coach their team for as long as he wants to coach the team. Coughlin also addressed how little he thinks about his own legacy. "It’s not about me and this is what we talk about all the time," said Coughlin. "We’re about team, we’re not about individuals. We’re about the team and what’s in the best interest of our team, and we feel that all our power is generated from team. "We’re certainly very cognizant of some of the superior individuals that we have on our team, thank goodness, but it is the team that provides us with our strength, and our ability to perform under pressure, whether it is good or bad, and that’s the way we think." There are a lot of great benefits to covering the Super Bowl. Tops on my list: The view. You can see plays as they actually develop. And when Eli Manning wound up to throw the ball down the sideline to Mario Manningham late in the fourth quarter, I thought the throw was trouble. For the Giants. The Patriots were playing two safeties deep like they were most of the game. Manningham was well covered. It was the type of throw Manning had judiciously avoided forcing into coverage all game, but the time had come to take a shot. Victor Cruz and Hakeem were the primary reads on the play. But Manning made what Manningham called a perfect throw. It’s the type of throw most quarterbacks don’t attempt. “Um, our quarterback does,” Victor Cruz said. Alas, the end of the football season really is around the corner. With the Superbowl only days away, it'll be a long wait before we see meaningful games again. Happily, we've got one good game left this weekend. With a line of only 3 points, it's certainly one of the closer spreads in recent Superbowl history. I wouldn't be surprised one bit to see a dramatic finish. As I've said before, these playoffs have delivered some amazing games. It would be perfect if it ended with just one more. I think it will. Both of these teams have key strengths and weaknesses, and both have the ability to take advantage and win. I'm going to deliver two picks for this one... first the winning team, and second, the over/under. I hope everybody has a great time watching the Superbowl this Sunday. I know I will! It's Manning vs. Brady for Superbowl 46. Who adds another ring? I wrestled with this one for quite awhile (which is why this is getting posted on 2/3), but I've finally decided to settle on New England. The simple fact at the core of all of my analysis is that I think the Patriots looked better winning against Baltimore than the Giants did against San Francisco. The Giants had major problems protecting Eli Manning, they had little success running the ball, and the defense was bailed out by a combination of Alex Smith's failure to throw the ball more aggressively and of course, the critical fumbles that led to 10 points. Still, there is plenty of room to argue that the Giants can win this game. First and foremost is the matchup of New York's receivers against New England's secondary. With Patriots WR Julian Edelman putting significant time in at nickel corner, you have to expect the Giants to have at least some success throwing the ball. Victor Cruz and Hakeem Nicks have to be considered one of the, if not the, top duo of receivers right now in the NFL. If one of them gets slowed down, the other one always seems to pick up the slack. The one thing that might slow them down though is their own offensive line. The Niners dominated the battle in the trenches last week and delivered blow after blow to Eli Manning. The Patriots d-line looked very sharp against Baltimore, and if they're able to apply pressure to Eli without having to bring extra pass-rushers, they may be able to keep enough players back in coverage to generate some stops. Adding to that same problem is the Giants inability to run the ball effectively. They've struggled with it all season and they didn't look any better last week. The Patriots managed to bottle up Ray Rice last week, holding him to 67 yards on 21 carries. If they can do the same against New York, they'll have even more opportunity to put additional men in coverage and focus on shutting down the pass. Last but not least, we need to take a look at Brady and the Patriots offense. The ankle injury to record-setting TE Rob Gronkowski has everyone wondering how effective he'll be come Sunday. I wish I knew. He did come back in against Baltimore and managed to get a couple of catches, so I expect he'll at least be able to play and force the Ravens to pay attention to him. That aside, looking at what Vernon Davis did to the Giants defense, Aaron Hernandez could be in for a huge game. With the offensive line playing well, I'm not too concerned about New York's pass rush. I'm sure they'll get to Brady every now and again, but I think he'll have decent enough protection throughout the game. Reviewing all of that, I'm left picking New England. More things seem to be going in their favor here. Again, I can absolutely understand anyone picking the other way here. It's a very tough matchup, but that's what should make it a great game. In case you didn't guess it from the score prediction, I like the over. I won't belabor the point with too much more analysis given the amount above. Basically, both of the defenses have questionable secondaries, and both of the offenses feature great quarterbacks, receivers, and are among the best in the league in passing. The defensive battles happened in the conference championship games. 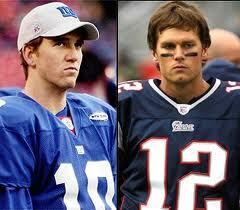 The Superbowl is going to feature to offenses battling for victory. Points will be scored and the over will be made.